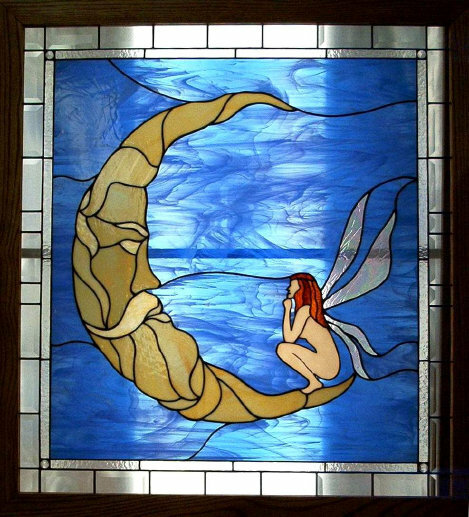 Fairy and the Moon was designed and built in February, 2003. 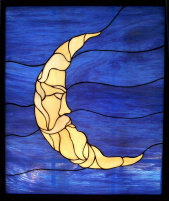 Containing 69 pieces of stained glass and bordered with another 36 clear bevels, this window measures 35 1/4" x 38 3/8". It is framed in a 3/4" x 2" stained and varnished red oak frame, ready to hang. 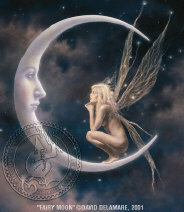 Fairy and the Moon is inspired by the beautiful fantasy painting "Fairy Moon" by David Delamare. I have always been amazed at Delamare's work but was afraid that the limitations of glass wouldn't even come close to the mystical feel of his work. In 1982, I built a window called "The Old Man" pictured to the left. When I decided to build "the Fairy and the Moon" , I already had a perfectly good moon in "The Old Man", so I was part of the way there. Jill called me from her home in Palm Coast, Florida. She and her husband were interested in my "Fairy in the Moon". 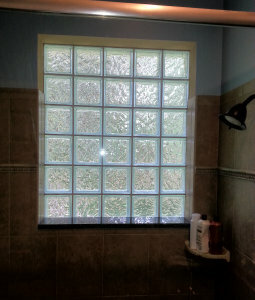 It has occupied a guest bedroom window in my home for the last 14 years, but Jill persuaded me that she had a new home for it that would be perfect.